ned by similarity to the word "tomato", the Spanish word "amarillo", meaning yellow, and a variation on the Maori word "tama", for "leadership". 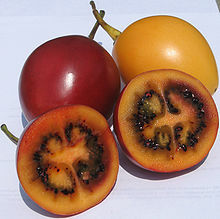 It is called Tree Tomato in most of the world. Plant Flower Cluster of Cyphomandra betacea The plant is a fast-growing tree that grows up to 5 meters. Peak production is reached after 4 years, and the life expectancy is about 12 years. The tree usually forms a single upright trunk with lateral branches. The flowers and fruits hang from the lateral branches. The leaves are large, simple and perennial, and have a strong pungent smell. The flowers are pink-white, and form clusters of 10 to 50 flowers. They produce 1 to 6 fruits per cluster. Plants can set fruit without cross-pollination, but the flowers are fragrant and attract insects. Cross-pollination seems to improve fruit set. The roots are shallow and not very pronounced, therefore the plant is not tolerant to drought stress, and can be damaged by strong winds. Tamarillos will hybridize with many other cyphomandra solanaceae, though the hybrid fruits will be sterile, and unpalatable in some instances. Fruit Cyphomandra betacea unripe fruits Cyphomandra betacea ripe fruits The fruits are egg shaped and about 4-10 centimeters long. Their color varies from yellow and orange to red and almost purple. Sometimes they have dark, longitudinal stripes. Red fruits are more acetous, yellow and orange fruits are sweeter. The flesh has a firm texture and contains more and larger seeds than a common tomato. The fruits are very high in vitamins and iron and low in calories (only about 40 calories per fruit).